Animation Prototyping for Mobile and Desktop. If you're looking for our Sketch plugin that brings timeline animation to Sketch, go here. Prototyping should be a quick process. The more time you spend animating, the harder it gets to let go of an idea. Even the bad ones. Mitya makes it ridiculously easy to animate, freeing you up to try as many ideas as you can think of. In a fraction of the time. Use desktop events or touch based gestures to create rich experiences. Chain animations together and create advanced motions and transitions. Design brand new experiences with Mitya's built-in support for Framer and CoffeeScript. Mitya's powerful Animation Engine watches all changes you make on your layers to build keyframes for you automatically. Change your layers along the timeline and Mitya will create all intermediate keyframes to make a perfect chained animation. designing animations like these become incredibly easy! When you have several ideas, making multiple versions to choose the best animation has always been hard. Until now. 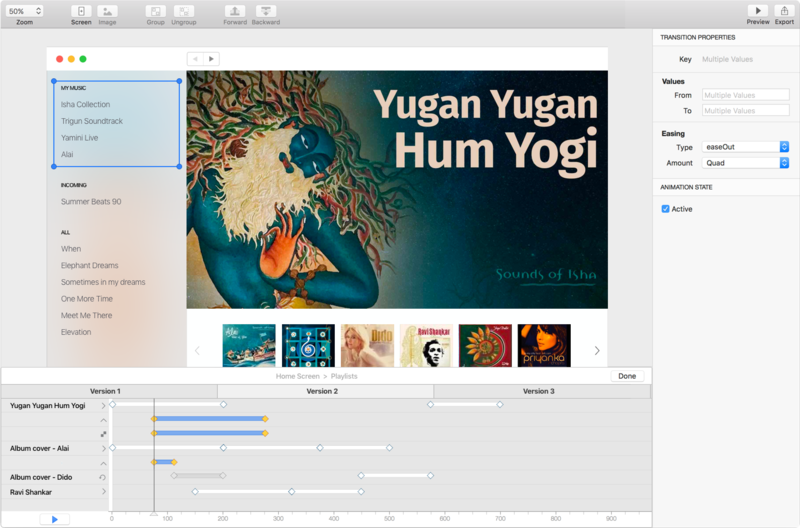 Mitya lets you build multiple timeline animations and compare them right next to each other. Playing with new animations is so easy, you'll no longer hesitate to try a new idea. The best way to invent something new has always been code. With Mitya's built-in support for Framer, you now get the best of both worlds. Speed up with Mitya's animation tools. Power up with Framer code.